ARBROATH INFIRMARY, ROSEMOUNT ROAD The infirmary was built in 1913-16 to designs by Hugh Gavin. It replaced an earlier building on the site built in 1844-5 to designs by David Smith. 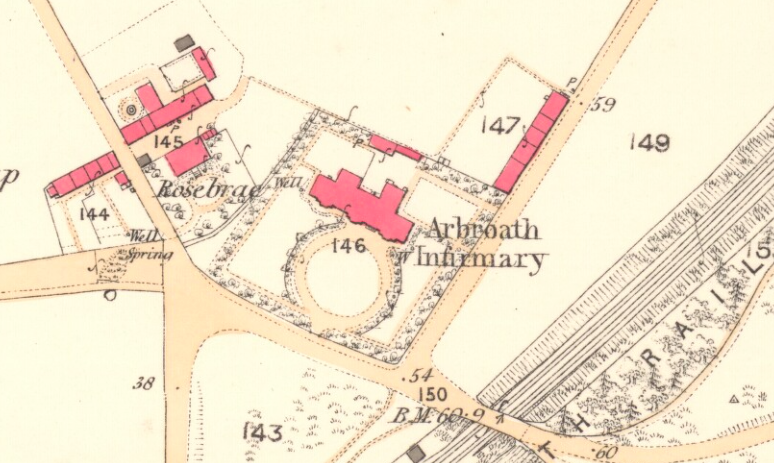 The origins of Arbroath Infirmary lay with the establishment of a dispensary in 1836. During an epidemic of typhus in 1842 a small ward was set aside to take fever patients. Funds were then raised to build a new hospital. Bristowe and Homes’s account of the Hospitals of the United Kingdom, published in 1866, described the infirmary as it then existed as a single, long building of two floors with the kitchen and offices built out behind, containing six wards on the ground and first floor with sixty beds. By the early years of the twentieth century the infirmary was overcrowded, and it was rebuilt on the standard pavilion plan, of two storeys with an H-shaped layout. It looks to have been built on a tight budget. Nevertheless, it has survived relatively intact and is a good example of the smaller general hospitals of the early twentieth century. The open sun veranda at the end of the ward to the left has only recently been enclosed at first-floor level. ARBROATH AND ST VIGEANS POORHOUSE, BRECHIN ROAD, ARBROATH (demolished) The poorhouse for Arbroath and St Vigeans was designed by William Aitkenhead in 1864. BRECHIN INFIRMARY, Infirmary Street The Brechin Infirmary opened as a general voluntary hospital in 1869. Groome’s Gazetteer notes that it was built at a cost of £1,900. Dismissed as ‘Dour’ by John Gifford in his brief notice in the Buildings of Scotland guide to Dundee and Angus, not without justification. CHARLETON MATERNITY HOME, MONTROSE Charleton House was built in the early‑nineteenth century and remodelled in 1892 by R. Rowand Anderson. 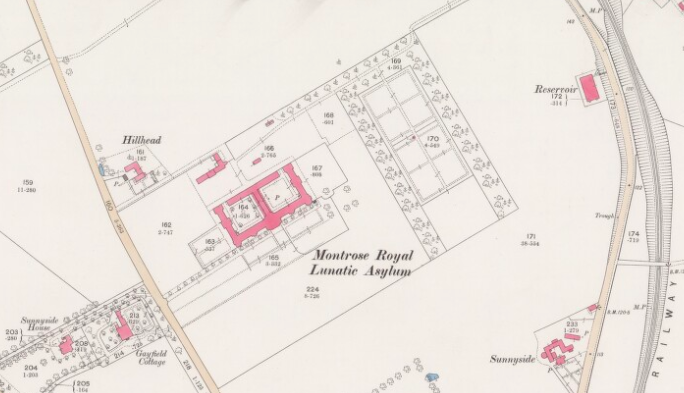 What was presumably an earlier house on the site was acquired by George Carnegie in 1769, whose wife, Susan, was the foundress of the Montrose Lunatic Asylum. 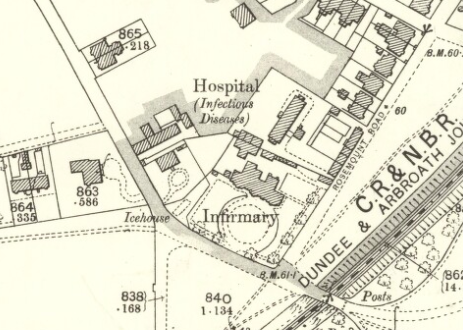 COUNTY HOSPITAL, INFIRMARY STREET, BRECHIN Provided as the county infectious diseases hospital by the local authority, the hospital was situated next to Brechin Infirmary, and near the poorhouse. 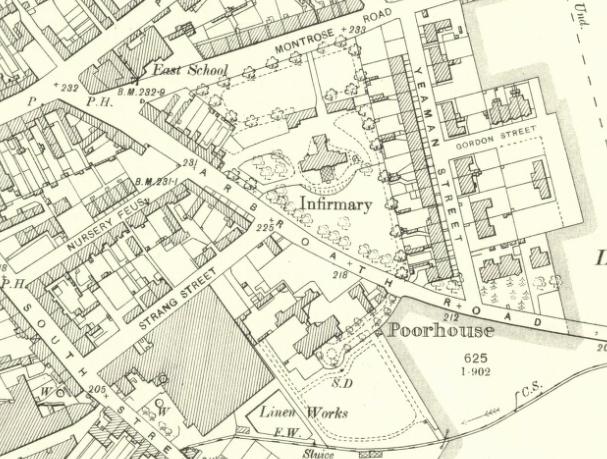 All three institutions were on the eastern edge of the town, between the cemetery and Victoria Park (see map, above, under Brechin Infirmary). 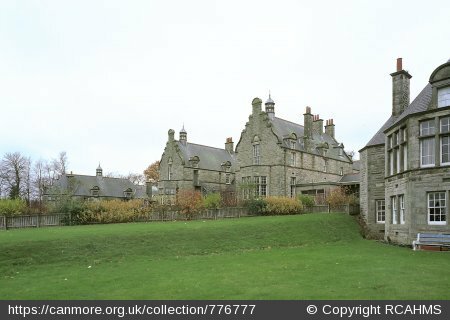 DORWARD’S HOUSE OF REFUGE, MONTROSE, now Dorward House Built in 1838-9 from funds gifted by William Dorwood, as a large home for the poor and destitute of Montrose. Possibly designed by James Brewster. FORFAR INFIRMARY, ARBROATH ROAD The hospital opened on 28 July 1862. 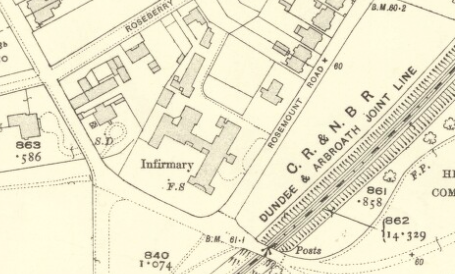 A public meeting was held in 1860 ‘for the purpose of resolving as to the erection of an Infirmary for the town of Forfar and the Central part of the County’. 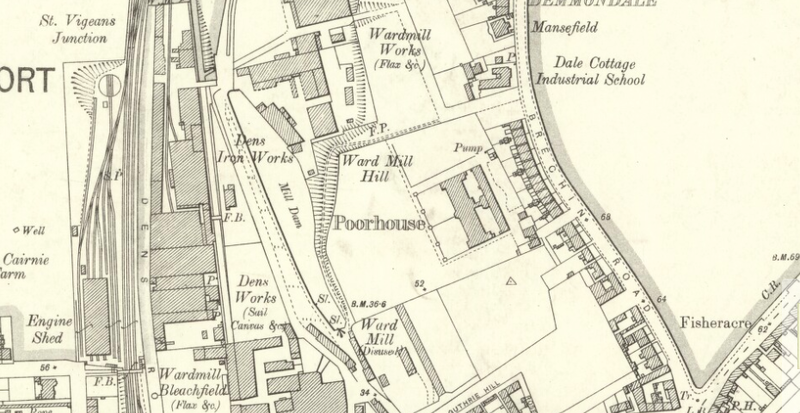 Extract from the OS Town Plan of Forfar, 1860. Reproduced by permission of the National Library of Scotland. Originally it provided 36 beds, comprising sixteen beds for typhus fever patients, four beds for scarlet fever and small‑ pox cases and sixteen beds for surgical cases. In 1927 a new nurses’ home was built with funds provided by Sir James Duncan of Kinnettles. The hospital was closed following the opening in 2005 of the new community hospital, the Whitehills Health and Community Care Centre, on the site of the former infectious diseases hospital (see Whitehills Hospital below). The old infirmary was then sold to developers and the building demolished. FORFAR POORHOUSE (mostly demolished) Originally situated on the outskirts of the town, Forfar Poorhouse was designed by David Smart in 1859‑60. 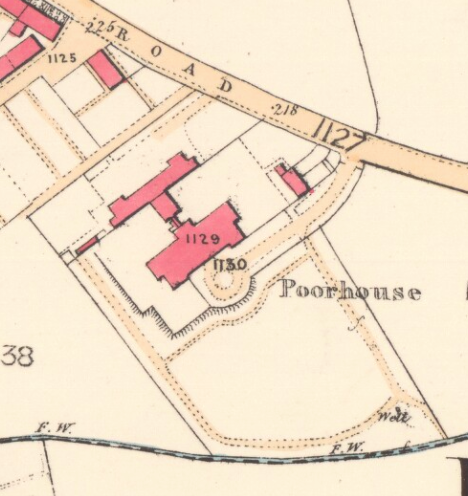 Extract from the 1st edition OS map, surveyed in 1861, a year after the poorhouse was completed. 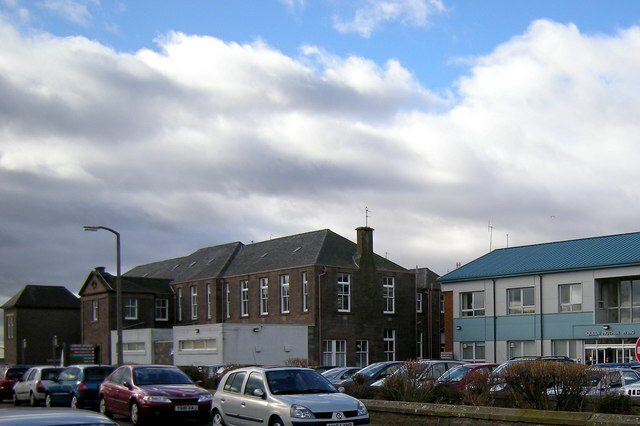 The building was roughly contemporary with the infirmary, built on the other side of the Arbroath Road (see above). Reproduced by permission of the National Library of Scotland. JENNYSWELL HOUSE, COLLISTON Jennyswell, or Jennieswells House, was built as a convalescent home for Arbroath Infirmary in 1890-1, with funds gifted by John Duncan of Parkhill and his broth Alex. 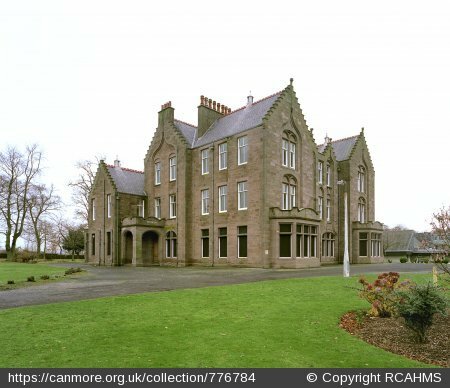 Duncan of Rhode Island, U.S.A.
LITTLE CAIRNIE HOSPITAL, ARBROATH (largely demolished) A fever hospital was established by Arbroath Burgh c.1870. In 1899 a competition was held for a new epidemic hospital, this was to be erected at the joint expense of the Burgh and District Committees of Forfar County Council to a cost of around £10,000. The competition was won by Hugh Gavin, of Arbroath, and the hospital completed in June 1903. MONTROSE INFECTIOUS DISEASES HOSPITAL The hospital was situated adjacent to the Montrose RAF station. MONTROSE ROYAL INFIRMARY The Montrose Infirmary was built to designs by a Glasgow architect, James Collie, and opened in 1839. It was built in a Greek revival style with a central tetrastyle portico with fluted Greek doric columns. 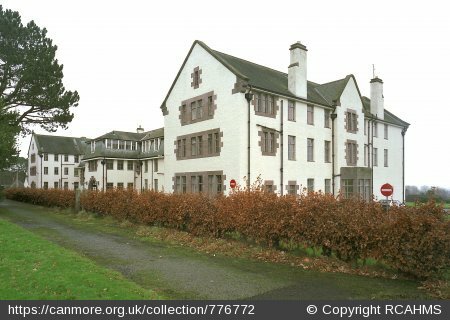 The foundation of the infirmary was linked with that of the lunatic asylum which began in 1781 as the Montrose Lunatic Asylum, Infirmary and Dispensary. MONTROSE ROYAL LUNATIC ASYLUM (demolished) The Montrose Asylum was the first such institution to be founded in Scotland. Its foundation was largely due to Susan Carnegie of Charleton who was moved by the plight of lunatics imprisoned in Montrose Tollbooth. With Provost Christie, Mrs Carnegie organized subscriptions to fund the establishment of an asylum. The first meeting of subscribers was held on 5 July 1779 at which it was decided to build a lunatic hospital at a cost not exceeding £500. The original building was completed in June 1781 and the first patient was admitted in May 1782. 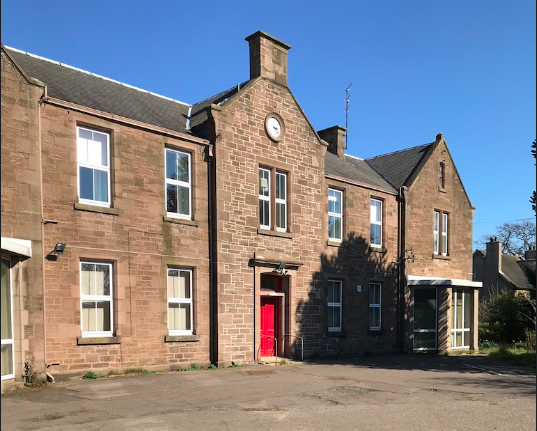 Initially it also served as an infirmary and dispensary but this side of its work was separated when the new Montrose Royal Infirmary was built in 1839. It was at this time that W. A. F. Browne was working as the physician superintendent at the asylum before he moved to the new Dumfries Asylum in that year. It was Browne who had recommended that the infirmary patients should be catered for in a separate building By the middle of the nineteenth century the buildings had become desperately overcrowded, despite various additions and alterations to the building. In 1855 the need for a new accommodation was recognised and a committee was appointed to look for a new site. 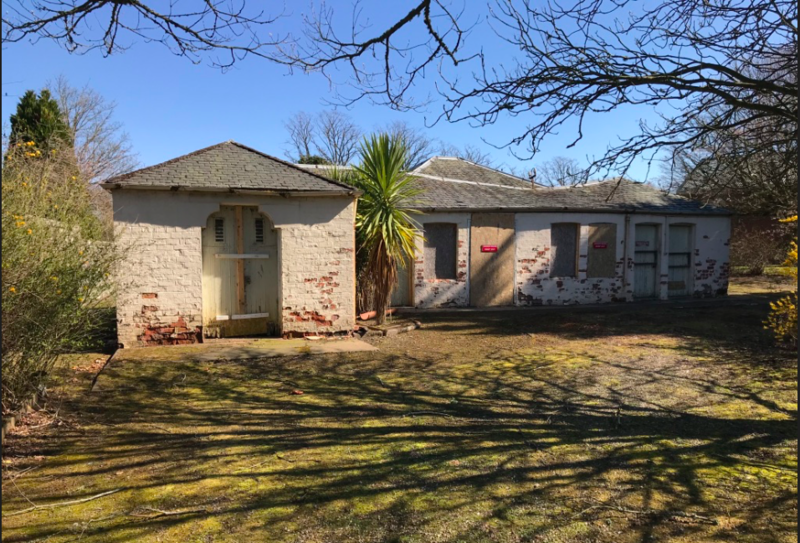 In the same year a Royal Commission was appointed to enquire into the state of lunatic asylums in Scotland which severely criticised the existing building. By 1857 when the new asylum was under construction there were 250 patients in the old asylum. In 1858 the new building was completed (see under Sunnyside Royal Hospital). 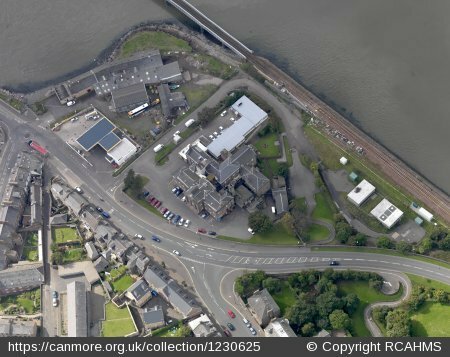 However, the old asylum continued in use until 1866 when it was leased to the Montrose Harbour Commissioners and used for a time as barracks. The accommodation provided in the old asylum by the mid‑ nineteenth century followed the usual pattern for the time largely comprising single rooms. There was a large central block of four storeys from which two, two‑storey wings projected. The airing courts were surrounded by high walls, but the ground in the middle of the courts was banked up to enable patients to obtain a view over the wall without being able to escape over it. 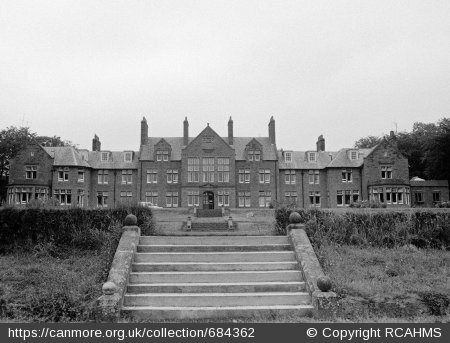 NORANSIDE SANATORIUM, FERN, later HMP Noranside House was purchased by Forfar County Council in 1914 and turned into a Tb sanatorium, opening as such in 1916. 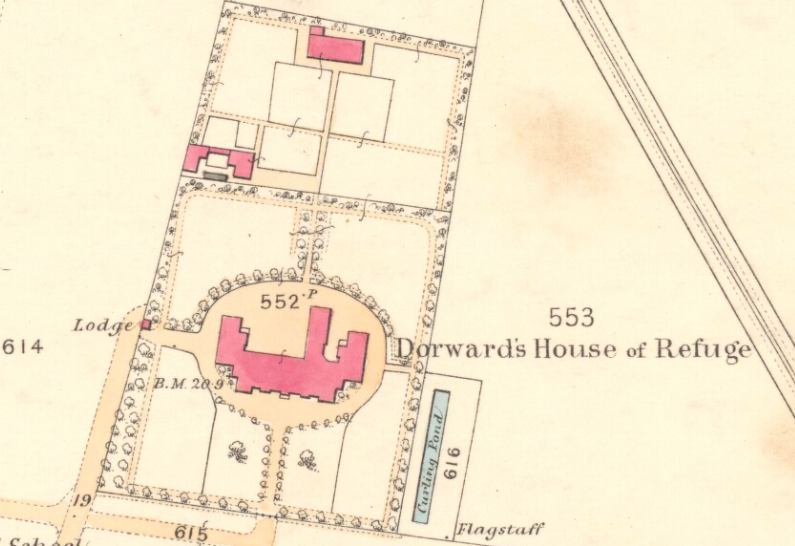 Ward blocks, designed by Maclaren Sons & Soutar were added in the grounds of the house, providing some 100 beds. It closed in 1960 and passed to the Home Office, to become a Borstal or young offenders institution, which opened in 1962. It later became an open prison. This closed in 2011, and plans for a housing development on the site were in the pipeline in 2014. ST DROSTAN’S HOUSE, Infirmary Street, Brechin The former Brechin poorhouse, and the second to be built in Brechin. A parochial lodging house of 1853 was superseded by a new poorhouse in Infirmary Street, built in 1879-80 to designs by James Baxter in a plain Tudor style. STRACATHRO HOSPITAL, NEAR BRECHIN Stracathro House was built in 1827 to designs by Archibald Simpson for Alexander Cruickshank. Alexander had inherited the estate from Patrick Cruickshank, who had made his fortune in Jamaica. Simpson designed a smart neo‑classical house of modest size. It was built into a sloping site, thus the principal front is of two storeys without basement and the garden front to the rear has a raised basement. 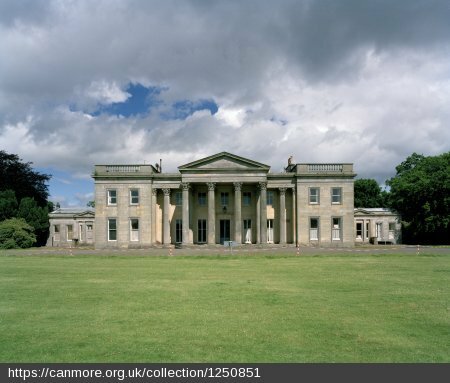 The main nine‑bay facade comprises slightly advanced outer bays capped by a stone balustrade and between these five bays set behind a screen of fluted corinthian columns in antis. This screen breaks forwards in front of the centre three bays forming a tetrastyle portico. 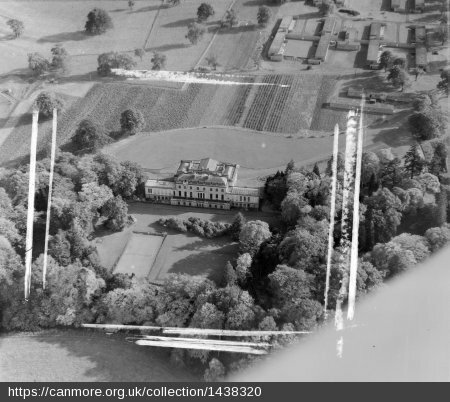 In 1848 the estate was purchased by Sir James Campbell formerly Lord Provost of Glasgow. Aero Pictorial photograph of 1953 in the collection of RCAHMS. Above the house at the top of the picture are some of the hospital huts built during the Second World War. 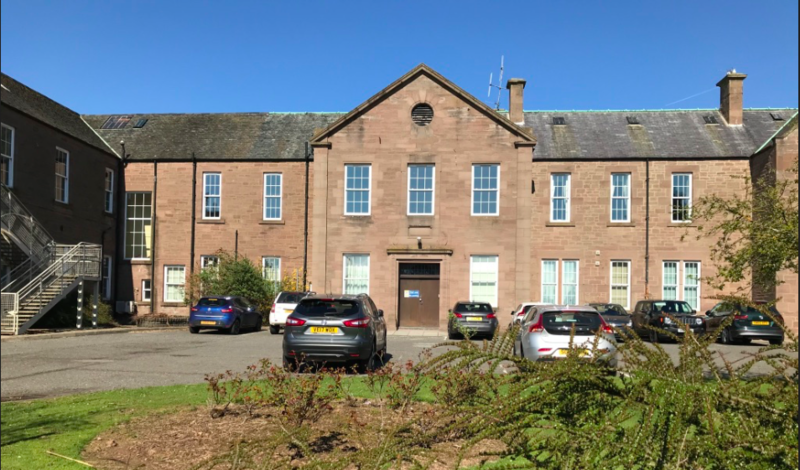 At the beginning of the Second World War it was acquired as the site for one of the seven Emergency Medical Scheme hospitals built in Scotland. Postcard with views of Brechin, including, top left, the mansion house at Stracathro Hospital, © H. Martin, reproduced with permission. Hutted ward blocks were built in the grounds to take the anticipated civilian casualties from air raids, while the house was used for staff accommodation. 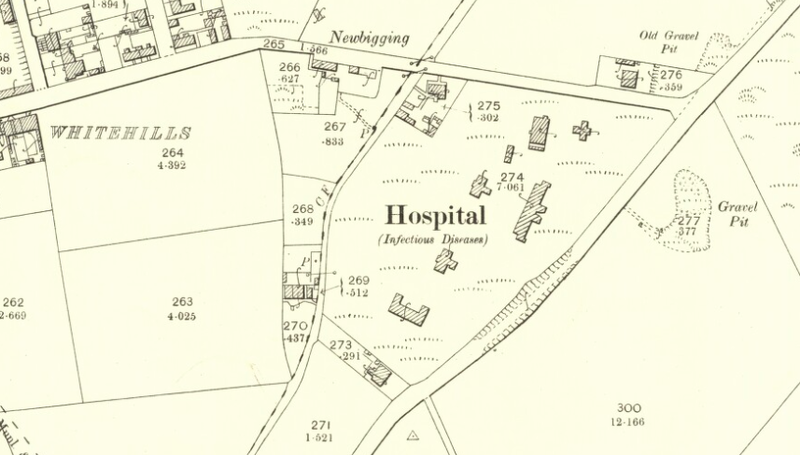 After the war it became a local general hospital, and was transferred to the National Health Service in 1948. Stracathro is the only one of the seven new EMS hospitals built in Scotland to have so far retained any of its original ward blocks. Most on the site have been largely, if not completely rebuilt, although the original footprint of much of the hospital remains. In 2011 the Susan Carnegie Centre, for patients with mental illnesses, opened on the site, designed to replace Sunnyside Hospital. Stracathro House was sold by Tayside Health Board in 2003 and was converted back into a private residence. SUNNYSIDE ROYAL HOSPITAL, MONTROSE The principal building on the site was built in 1855‑57 by William Lambie Moffatt. 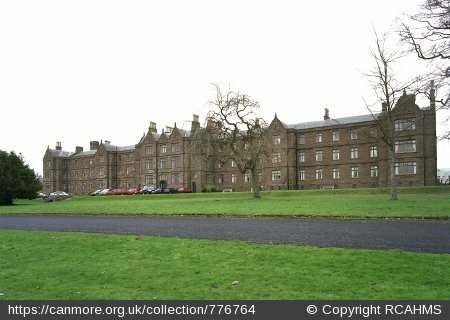 It replaced the earlier Montrose Lunatic Asylum of 1781, the first of its kind in Scotland (see separate entry). Moffatt’s new building cost £27,513 7s 5d. It was designed in the Tudor style he often adopted, of three storeys and relates closely to his poorhouse designs. For the first few years the old asylum in the town was retained and following the Scottish Lunacy Act of 1857 many more pauper lunatics were admitted as there was no District Asylum. There were various alterations and additions made to the main building including a new dining and recreation hall. Of the separate buildings added to the site the first of importance was the hospital block designed by Sydney Mitchell & Wilson in 1888. A competition had been held for the design and the opinions sought of H. Saxon Snell & Son, the London‑based architectural practice best known in the field of hospital design at that time. 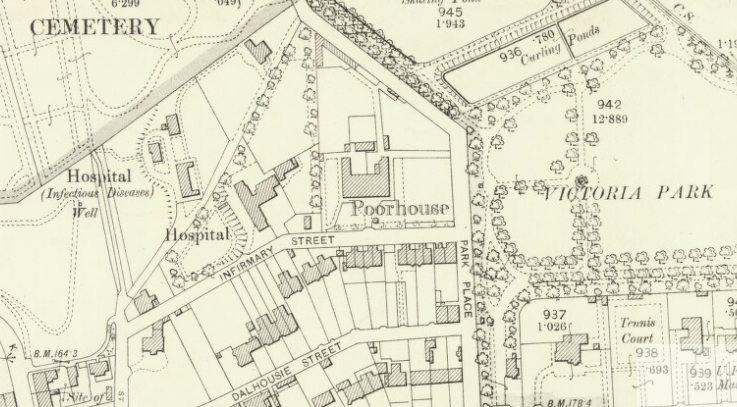 The hospital was a single storey block to the south‑west of the main building. In 1896 work was being carried out on a new house for private patients, the designs for this were prepared by William Kelly of Aberdeen, like Sydney Mitchell, he was well established in the field of hospital design. Carnegie House, as the new block was named, was built on the same philosophy as Craighouse in Edinburgh, that surroundings contributed to cure. Carnegie Lodge was built by W. C. Orkney in 1900. A further two villas were built, Howden villa, to the rear of the main building, was designed by a local architect John Sim, and North Esk villa, built in 1902 to the north‑east of the main building. North Esk Villa has a bold gabled elevation with a particularly distinctive window design. The first and second floor windows are set in panels which rise to blind‑pointed arches. 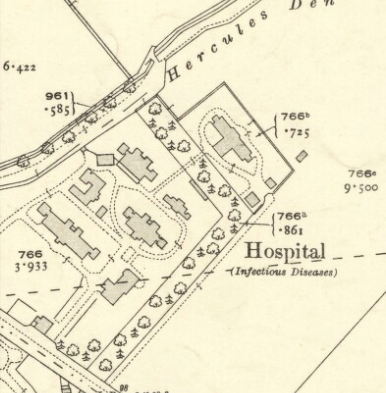 In 1935 a large nurses’ home was opened to the south of the site set down the hillside so as not to disrupt the view from the patients’ accommodation. WHITEHILLS HOSPITAL, FORFAR Whitehills Hospital was built as the County Fever Hospital in 1901. A competition was held in 1899 for the design which was won by McArthy and Watson of Edinburgh. Alexander Cullen of Hamilton was awarded second place and T. Martin Cappon of Dundee placed third. Tried this list to find a hospital in parish of Panbride county of Forfar 1914-1919. possibly a temporary military fever hospital, can you help?